Ho Chi Minh City with particular is the most populous city in Vietnam, is the center of politics, economy, culture, science and technology, tourism services ..., the city was the attention of the investors at home and abroad to have a lighting system commensurate with technical requirements, management, economics poses as modern and advanced, accurate, fast, stable, safe and efficient . APPLIED SCIENCE AND TECHNOLOGY IN THE MANAGEMENT OF ADVANCED URBAN LIGHTING SYSTEM Ho Chi Minh City with particular is the most populous city in Vietnam, is the center of politics, economy, culture, science technical, tourist services ..., the city being the interest of investors in and outside the country must have an adequate lighting system with technical requirements, management, economics arises modern, advanced, accurate, fast, stable, safe and effective. In our country investment purposes of the public lighting system has been identified as a public utility, the needs and reflect the level of urban development. The investment in the right place for the system is switched on physical investment will create an impetus for improving management efficiency with the standards of the advanced world. 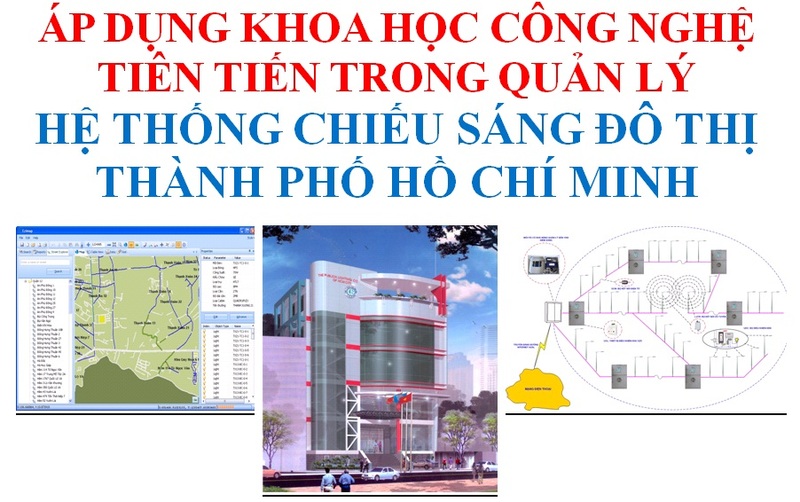 Since then public lighting system will contribute with the system other infrastructure problem solving current urban management, building a Ho Chi Minh City civilized, modern. - Establishing central control of public lighting system in HCMC. - We put the center into use with the control system 12,000 light points. - I'll be expanding to the whole bright spot in the future. 2. Apply management practices on digitization of GIS maps combined with GPS devices. - Deployment of the entire position highlighted on the city by the management company. - Research and application of GPS devices combined with digitized map. 1. Research applied Control cabinets reduction (switcher system). 2. Application of LED lighting for public areas. 3. Application of magnetic induction luminaires. 4. Deploy the widespread use of public Lamps High Performance Control 2 power levels. 5. Applications luminaires use of clean energy (wind, solar). The application of advanced science and technology in the management of the public lighting system is always special attention of corporate leaders CSCC City. We are pleased to introduce a number of solutions that the company has access to study and initially deployed should not avoid these shortcomings, because they all still very new, it takes time to summarize Practice. We look forward to receiving contributions from colleagues to help build our lighting industry is growing "High Rise, Shine" to all parts.